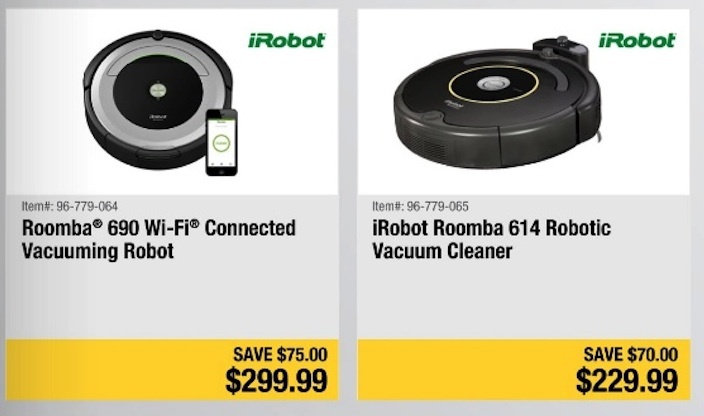 Ditch your vacuum cleaner for a deal on an iRobot Roomba this Black Friday 2019. 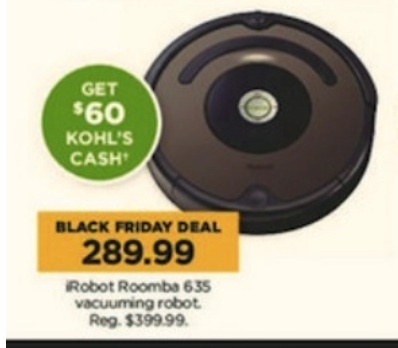 We will bring you info about the biggest and best deals and discounts here when the savings are announced online or in an advertisement between Thanksgiving Day and Cyber Monday 2019. We are committed to helping you find the best shopping deals of the year from Amazon Prime Day to Thanksgiving Weekend. So get ready to save in 2019, 2020 and beyond! 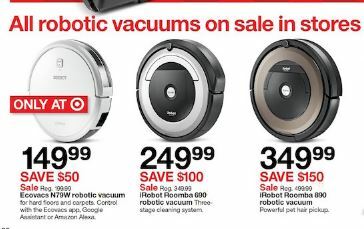 These robotic vacuums are ready to automate cleaning your floors. 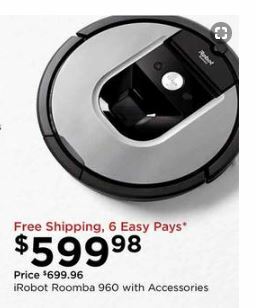 From minimal, affordable options to the latest in smartphone controls, multi-room navigations, wall restraints and battery technology, there is definitely an option that will free you from pushing around a clunky vacuum cleaner in your attempt to beat back the dust, dirt and debris that accumulates in a home. 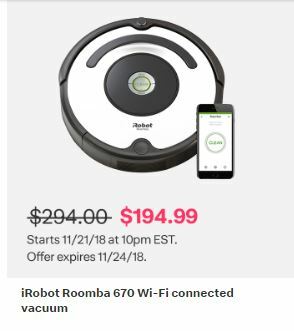 After scanning more than a dozen ads for sales on vacuums, we have found discounts on 7 different models of the iRobot Roomba over Thanksgiving weekend this year. If you want to join the smart home movement. A newer model than the 650. 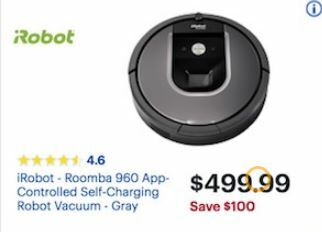 It is a basic robotic vacuum without the bells and whistles. It operates with a random cleaning style. It does NOT have multi-room navigation, virtual walls or smart scheduling. * Note: We have not included prices from Amazon because they run their Black Friday deals throughout November. Due to the sheer number of lightning deals, one-day discounts and other special offers, we couldn’t possibly keep the price right throughout this period. We encourage you to check the links provided for the latest deals and discounts they are offering. We had trouble finding trustworthy reviews for this model. 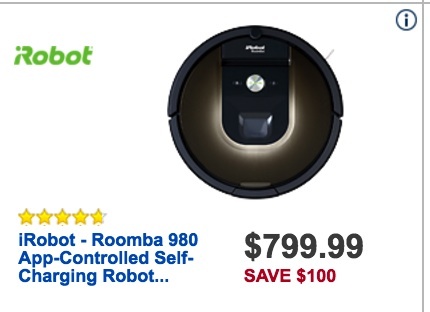 A self-charging robot vacuum that will clean your room at the push of a button. 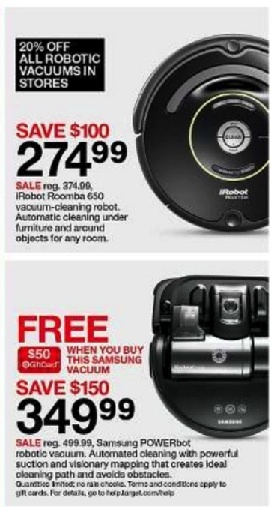 Presets available for frequency and the vacuum returns to its home base for recharging between cleanings. 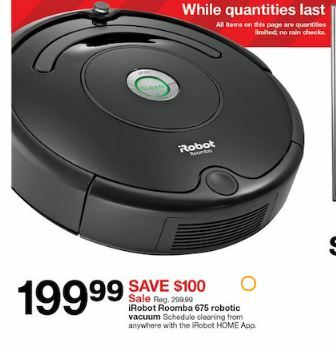 This is one of the best selling robot vacuums in 2017. 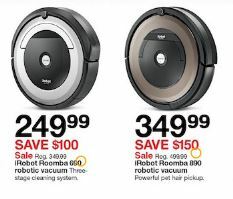 An entry-level product in the Roomba line that is relatively affordable. Compatible with voice commands and includes a Wifi connection for control via the smartphone app. However, you can expect it may have occasional navigation issues, particularly with dark flooring. 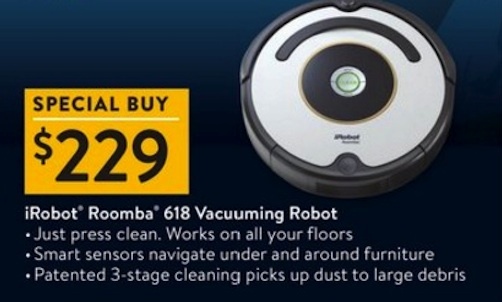 This vacuum has smartphone app reports, camera navigation and Amazon Alexa/Google Assistant voice control. It is able to move across different floor types and maneuvers better around furniture and other obstacles than previous versions. It also is more methodical in its movements than previous versions which had random cleaning. 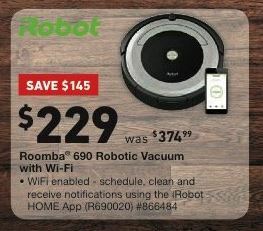 The Roomba 980 is a self-sufficient, WiFi enabled robot vacuum that is the top of the line vacuum from iRobot right now. 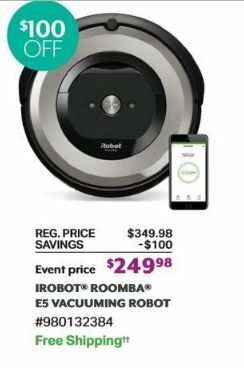 It has smartphone enabled controls and a new grid-based movement mapping rather than the random cleaning style of previous Roomba vacuums. It also has a longer lasting lithium ion battery than previous versions. 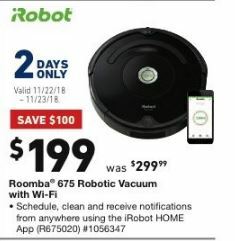 We haven’t seen any of these deals extended to Cyber Monday yet. 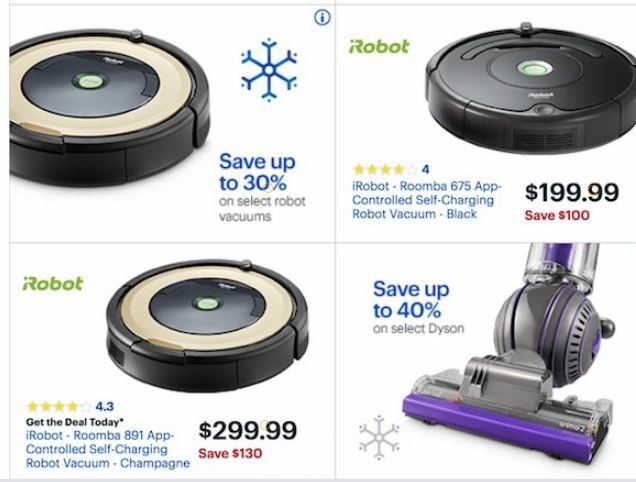 However, we expect there will be sufficient demand for these robots that some or all of them will be promoted online this year. We will update this page as we discover additional possibilities for savings to bring to you. That’s all for the moment, folks. But we’ll be adding more as soon as we find them.